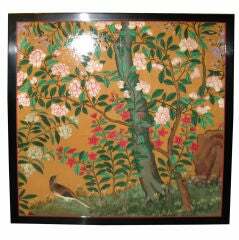 A beautiful, large scale Chinese panel, hand painted in gilt and darker tones on a red lacquer background, and framed with an open work border at the top and base. Design is of figures and pavilions among water and mountains. There is openwork carving as borders. With some cracks, typical of age. 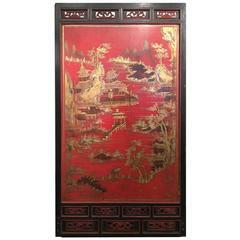 A monumental Chinese red lacquer panel, with hand-painted design in gilt and darker tones of figures and pavilions in a water landscape, with an ornate openwork frame. 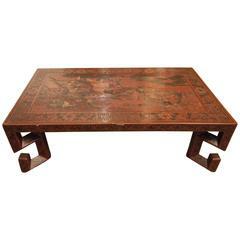 An interesting low Chinese antique lacquer table. 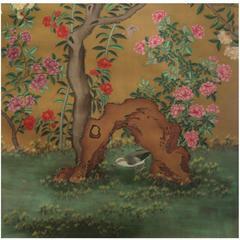 With incised and detailed landscape and figure design and intricate borders. Unusual legs of geometric form. Antique impressionist landscape oil on canvas. Bucolic landscape with trees and blue mountains.